VASILY MAXIMOV/AFP/Getty ImagesRussia’s S-400 Triumph air defence missile system. During a whirlwind trip through the Middle East last year, President Donald Trump touted a $US110 billion purchase of US arms by Saudi Arabia. But that blockbuster sale was a lot less definite than it seemed, and Riyadh has reportedly resisted finalising some of the deals. That reluctance comes as the Saudis continue talks with Russia over its S-400 air-defence system. President Donald Trump heralded Saudi Arabia’s purchase of $US110 billion worth of US arms during a trip to the Middle East in mid-2017. In the weeks afterward, however, it was revealed that the blockbuster sale was in fact “a bunch of letters of interest or intent,” according to Bruce Riedel of the Brookings Institution. Now it seems that some of those deals remain up in the air, and the Saudis have their eyes on a rival’s wares. According to The Washington Post, among the agreements still up in the air is the $US15 billion purchase of the Terminal High Altitude Area Defence System, made by US defence contractor Lockheed Martin. In a sign of Trump’s continued emphasis on arms sales as a component of US foreign policy, White House senior adviser and Trump son-in-law Jared Kushner personally intervened with Lockheed to secure a 20% discount for the air-defence system. But Trump administration officials told The Post they worried the THAAD price would now increase as US willingness to agree to co-production provisions Saudi Arabia has requested in the contract will decrease. Perhaps more concerning for US officials is Saudi Arabia’s continued interest in the Russian-made advanced S-400 air-defence system. According to The Post, the Saudis have resisted US requests to disavow their interest buying the S-400 and have continued talks with Moscow. Saudi Arabia would be only the latest ally with interest in the Russian-made air-defence system. Turkey has already bought the S-400, earning rebuke from the US Congress and creating concerns within the NATO alliance. 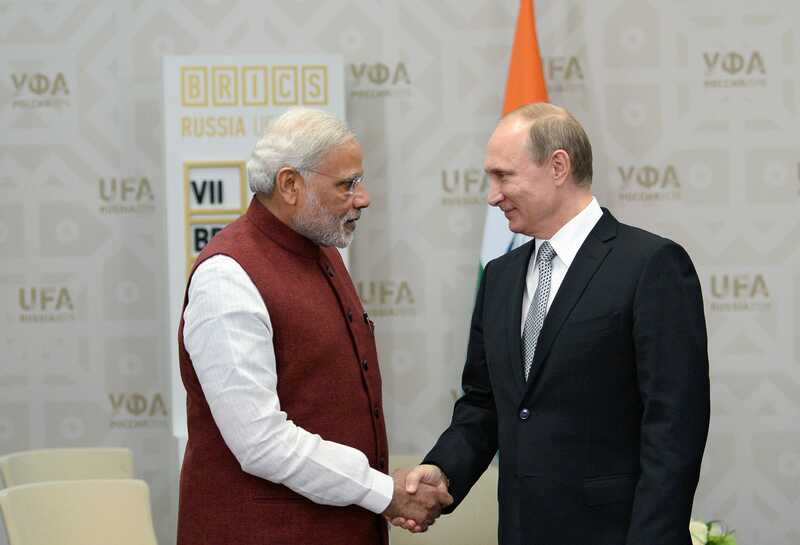 India also recently agreed to buy the air-defence system during a summit earlier this month – a deal that raises the prospect of US sanctions on New Delhi. Getty ImagesIndian Prime Minister Narendra Modi and Russian President Vladimir Putin. The news of Riyadh wavering on the THAAD deal comes amid increasing scrutiny on Saudi Arabia over the disappearance and alleged killing of Saudi journalist Jamal Khashoggi. Khashoggi had been in self-imposed exile for the past year, during which he wrote columns critical of Saudi leadership – including embattled Crown Prince Mohammed bin Salman, son of the king and considered the country’s day-to-day ruler – for The Post and other outlets. Khashoggi went into the Saudi Embassy in Istanbul on Tuesday to get a document needed for his wedding and has not been seen since. Saudi officials said he left shortly afterward but haven’t provided evidence of that, and Turkish officials reportedly believed he was killed inside the embassy. While the US has said little publicly about the disappearance, Secretary of State Mike Pompeo is reportedly frustrated that Riyadh has provided little of substance in response to direct high-level inquiries, according to The Post. In an interview with Bloomberg last week, Mohammed bin Salman denied any knowledge of Kashoggi’s whereabouts. 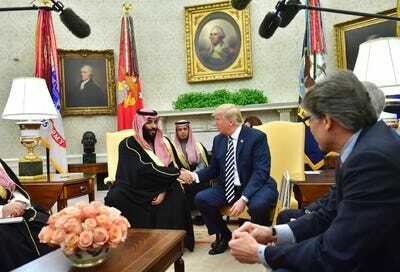 Pool/Getty ImagesSaudi Crown Prince Mohammed bin Salman in the Oval Office with President Donald Trump. The Trump administration has worked in lockstep with Saudi Arabia, often deflecting criticism about the US role in the Saudi-led campaign in Yemen, which has caused civilian casualties and famine among the population there. At a late September rally, however, Trump appeared to chide Riyadh over defence matters, telling the Saudis to “pay for your military” and saying that the crown prince “might not last two weeks in power” without the US. Asked about those comments, the crown prince told Bloomberg that his kingdom has been in existence for longer than the US and that it had been able to protect its interests even as, he said, President Barack Obama worked against them.